Jeff Siegel and Zoe Cadman analyze Tax and Haikal following their Thursday works for the Kentucky Derby. We also hear from trainers Danny Gargan and Kiaran McLaughlin as they discuss strategy leading up to the first Saturday in May. Jeff Siegel's second top play on the Thursday card at Gulfstream Park comes in the 10th Race with Ghostly Beauty, a horse who ran a better-than-looked debut at Saratoga and now gets Lasix for the first time. Jeff Siegel's first top play at Gulfstream Park on Thursday comes in the third race where he selects Waikiki, who gets a go-to rider and has been working quite well in the morning. Jeff Siegel releases his latest Triple Crown rankings and sits down with Zoe Cadman to analyze the chances of two interesting longshots in the Kentucky Derby; Spinoff and Plus Que Parfait. Zoe Cadman and Jeff Siegel highlight horses who ran last week at Santa Anita Park, Laurel Park and Keeneland that are worth following in their next starts. This week's horses to watch include: Ode to Joy, Highest Honors, Querelle and Katsaros. Improbable and Long Range Toddy, who were separated by a neck in the Rebel Stakes before both being defeated by Omaha Beach in the Arkansas Derby, worked Monday at Churchill. Jeff Siegel and Zoe Cadman analyze their works to gauge how they are coming into the Kentucky Derby. Tacitus and By My Standards have continued to improve throughout the Triple Crown Trail. 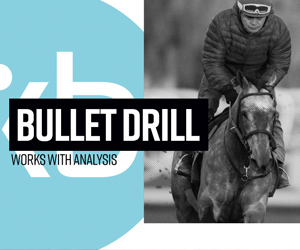 Jeff Siegel and Zoe Cadman give in-depth analysis of their recent works to determine if they have maintained their sharp form heading into the Kentucky Derby. Millie Ball and Jeff Siegel take a closer look at Roadster and Game Winner's works from Santa Anita Park on Saturday as well as Alwaysmining's win in the Federico Tesio Stakes from Laurel Park.